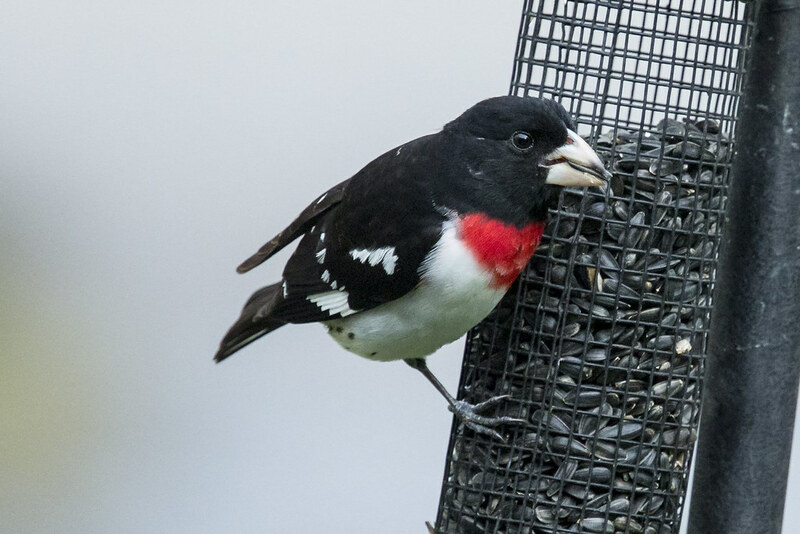 Today, we had Rose Breasted Grosbeaks at our feeders. This was super emotional for me. Why? In the spring of 2009, or maybe 2010, Ethan’s interest in birds took an aggressive twist. Until then, I somewhat thought it a quirk of his childhood. Something he would outgrow – a phase, or a passing interest. One day, when I came home, he was going on about having seen a Rose-breasted Grosbeak at the feeder. He described it to me, and it was a bird I had never seen. I wrote it off as the ramblings of a 7 year old child with an active imagination. After all, prior to us having bought him an actual bird book published after 1940, (about thirty days before this), everything was a Chipping Sparrow. Besides, I was pretty certain at the time that I would only see chickadees, cardinals, and robins in my yard along with the yucky black birds that make a lot of noise. The very next day, sitting in my family room, a bizarre looking bird landed on the feeder. 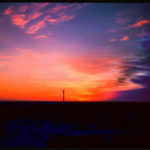 I grabbed my camera (5D with a 200mm lens) and took some very grainy pictures through the window. Interestingly, I had just finished reading Outliers – I’d learned how Bill Gates became a great programmer because he was able to compile and debug code on the fly (as opposed to the tedium of punch cards where a single mistake can take weeks to debug). I had an idea – I would photograph all the crazy things that Ethan sees, and give him the same kind of debugging feedback. The old way of birding, where the birder sees the bird, then either right there of later on starts flipping through pages in a book, and trying to work from a faulty memory, reminded me of how programmers used to have to work. They would make a bunch pf punch cards, put them in a stack (don’t drop them! ), feed them through a computer, wait for it to compile, and then debug. With the advent of on the fly compiling, you could program and compile much more quickly. I would do this for my son, he would see the bird (write the code), identify it (compile it), and then check it against the photo (debug). I became hooked. I already loved photography, I am fortunate to work for a great, successful income that allows me to travel and purchase equipment, Ethan loved birds, and so I became a review tool he used for verification (birds in flight, distance shots, etc), and I became his student. Through him, I’ve learned to become a better parent and a better photographer. I’ve learned that when you, the parent, fuel the fire that is in your child, when you fan the flames, they become a conflagration, a burning inferno of passion. All you have to do is create opportunity, and get them whatever they need to learn, and.then, the child becomes amazing. If you can do what they love with them, all the better! If you would like to know more, you must purchase the book and return here. Further information will not be available until the book is released. If you are a test flight user, you can reach me via email with any questions. eeCardinal is built on Glimpse360 technology, which is also produced by Scorellis. eeCardinal may not be the final name of the product. For support on eeCardinal, the namespace on flickr, or on Glimpse360 vector technology, contact scorellis through the self-same address at gmail.com. Solicitations or inquiries regarding the app development, jobs, photography, etc, are not being accepted at this time. This morning I awakened and as I got dressed, I thought to myself,”Iit’s not waffle Wednesday, why am I putting on waffle? Too bad there’s not a material called ‘thurple’. “Hey, that would be a good name for my app. ” Then I googled it and found very few results. This one stood out, because my app is about creating an identification space. Then I said the word out loud. Then I decided it didn’t make sense. The search for a catch name continues. For now it is still eeCardinal.